Paul Baron is a performing artist/clinician for XO Jupiter Instruments signed in both Canada and The United States and has been a proud member of the team for over ten years. Booking a clinic can be handled in a few different ways: by contacting your local Jupiter dealer or store and re requesting Paul, by contacting your local Jupiter district manager directly, or by contacting Paul directly to help facilitate. Clinics can be tailored to suit the needs and levels of the group. 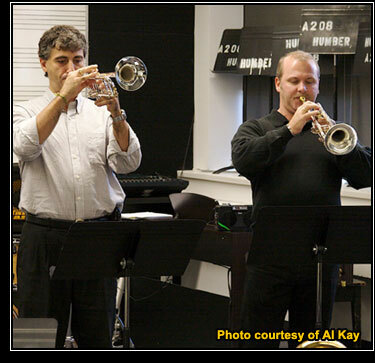 Paul's brass clinics deal with issues all brass players face, how to get a resonant tone, increasing range, power, flexibility, efficient use of air and compression, and overall efficiency in playing. The clinics can be more of a lecture or if desired, more participatory involving many students who want a chance to play. Other instrumentalists enjoy sitting in and learning concepts that apply to their instrument as well. Often times the clinics deal with the music business, how to become employable and the skills needed, how to stay employable, and how to build your business more successfully. In addition to more brass and trumpet specific clinics, Paul has worked with many big bands on phrasing, ensemble playing, playing with good time and intonation, and overall enhancing of the musical performance. All clinics are relaxed and open for a Q &A and discussion. It's interesting to see how a clinics can take on a life of it's own with the question often leading in directions of interest to other students. Paul has taught clinics at Western Washington University, Cleveland State University, Selkirk College, Eastern Washington University, The University of Toronto, Humber College, The University of Colorado, The University of Utah, as well as dozens of junior and senior high schools. In addition to Paul’s busy playing and touring schedule, he enjoys squeezing in some private and group lessons at home and on the road as well. If you'd like to set something up please look at the calendar page and contact Paul directly. It is always more time efficient to write down a short list of what you would like to cover in the lesson i.e. : range, air efficiency, sound, endurance, etc, to maximize our results. - Prepay for lessons and clinics here through PayPal. - View Instructional Articles and chapter previews from Paul's book, "Trumpet Voluntarily".